NJB Article and Source Repository: The Eleven Nations of North America. By Colin Woodard. 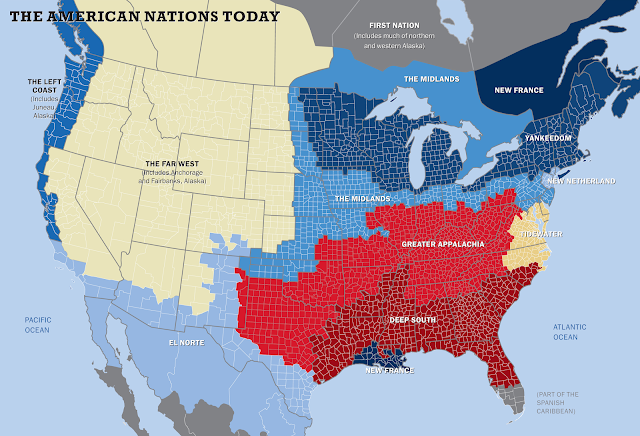 The Eleven Nations of North America. By Colin Woodard. Up in Arms. By Colin Woodard. Tufts Magazine, Fall 2013. The precise delineation of the eleven nations—which I have explored at length in my latest book, American Nations—is original to me, but I’m certainly not the first person to observe that such national divisions exist. Kevin Phillips, a Republican Party campaign strategist, recognized the boundaries and values of several of these nations in 1969 and used them to correctly prophesy two decades of American political development in his politico cult classic The Emerging Republican Majority. Joel Garreau, a Washington Post editor, argued that our continent was divided into rival power blocs in The Nine Nations of North America, though his ahistorical approach undermined the identification of the nations. The Pulitzer Prize–winning historian David Hackett Fischer detailed the origins and early evolution of four of these nations in his magisterial Albion’s Seed and later added New France. Russell Shorto described the salient characteristics of New Netherland in The Island at the Center of the World. And the list goes on.